As a general rule I steer clear of remix albums. I picture them to be a collection hastily of produced tunes that deflower originals. Perhaps the only remix album I’ve enjoyed to-date is Bjork’s Telegram, because it was such stark and confronting take on her early pop songs. It was a sign of what she had in store for us. 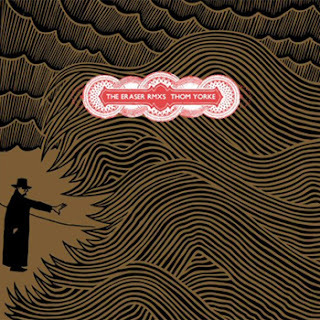 So I was worried when I discovered that Thom Yorke’s delicious solo debut, The Eraser was being released as a remix album. That is, until I saw the black and gold-foil, fold out packaging and the music nerd in me bubbled with greedy desire. Well, that and the impressive list of producers attached to the album – including Burial, The Bug and Four Tet. I’m now thrilled to own this because The Eraser Rmxs holds its own against its predecessor. In fact, Mr Yorke could easily have released this as the original. Remix albums are generally disjointed affairs, but much care has been given to flow of this record. Although the producers keep their individual styles (Burial’s creepy dub-step makeover is the most obvious) each track feels like part of a greater whole. Nor is there anything as obvious as dumping a house rhythm or break-beat under a sliced n’ spliced vocal sample. There’s pretty much none of that here. In fact all but two of the tracks here rely on the sweet and soulful vocals that made The Eraser such a joy in the first place. Each of the nine tracks ebb and flow, taking you on a short walk within a greater journey. No one over indulges or flexes their production muscles. These tracks actually breathe. Yes, it definitely is fucked up, Mr Yorke; because The Eraser Rmxs shouldn’t be such a solid album. Given those responsible for the remixing are all experienced at creating unique and interesting compositions, I shouldn’t have been a doubter. Still, I’d be interested to know how much influence Mr Yorke had over the structure and general vibe of these tunes, such is their emphasis on ‘song’. But whatever, if you’re a Radiohead fanatic or not, this comes highly recommended.